Ask RP Photonics for advice on beam quality and related aspects of lasers. The beam parameter product (BPP) of a laser beam is defined as the product of beam radius (measured at the beam waist) and the beam divergence half-angle (measured in the far field). The usual units are mm mrad (millimeters times milliradians). The BPP is often used to specify the beam quality of a laser beam: the higher the beam parameter product, the lower is the beam quality. The BPP can also be defined for non-Gaussian beams. In that case, second moments should be used for the definitions of beam radius and divergence. The smallest possible beam parameter product is then achieved with a diffraction-limited Gaussian beam; it is λ / π. For example, the minimum beam parameter product of a 1064-nm beam is ≈ 0.339 mm mrad. Figure 1: Beam parameter product and M2 values of various laser types. 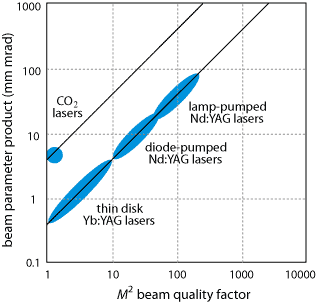 Due to the longer wavelength, CO2 lasers have a larger beam parameter product than diffraction-limited 1-μm solid-state lasers, but still compare favorably with lamp-pumped systems. For non-circular beams, the BPP can be different e.g. in the vertical and horizontal direction. Note that the BPP remains unchanged when the beam is sent through some non-aberrative optics, such as a thin lens. If that lens generates a focus with smaller beam waist radius, the beam divergence will increase correspondingly. For measuring the BPP, it is thus allowed to form a focus of convenient size, dependent on the equipment used (e.g. a beam profiler) and the available space (which has to extent over several Rayleigh lengths). Non-ideal optics can “spoil” the beam quality and thus increase the BPP. In some special cases, slight aberrations of an optical element (such as a spherical lens) can somewhat reduce the BPP of a laser beam, if the beam has distortions which can be compensated with that element. A related, less frequently used quantity is the diameter–divergence product.